‘Angel's Trumpet’ is the common name associated with plants from either the Datura or the Brugmansia family and for good reason to – both of these spectacular natives of South America will make a stunning addition to any tropical effect garden. 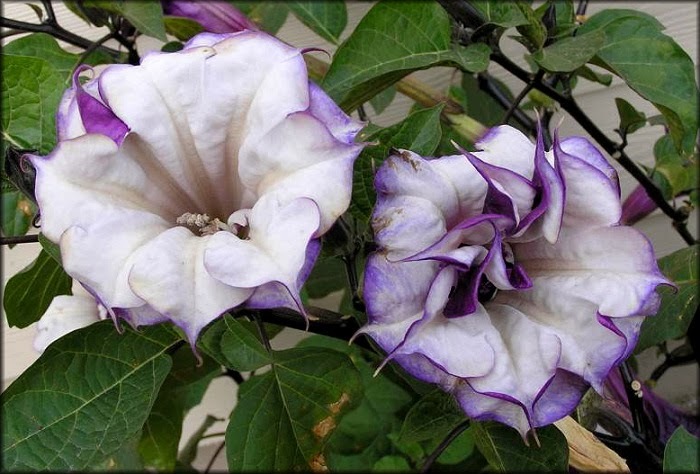 Often confused with its close relation the Datura, the Brugmansia is distinctly different in that it can grow as large into a small tree whereas Datura are annuals and will only attain the size of a small bush. In addition, the majority of Brugmansia will display their dramatic flowers pointing downwards while those of a Datura will point upwards. As a generalisation, the Angel's Trumpet, is a large, shrub-like, fragrant flowering plant that behaves like an annual in colder climates, although it can survive winters as far north as zone 5. However, young seedlings will fare better if they don't face a late spring frost. Start seeds indoors, and transplant them after the last expected spring frost date. 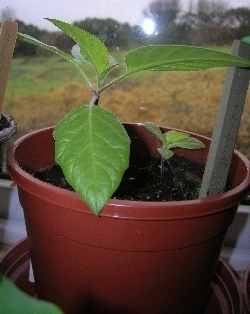 Sow Angel's Trumpet seed from February to March. 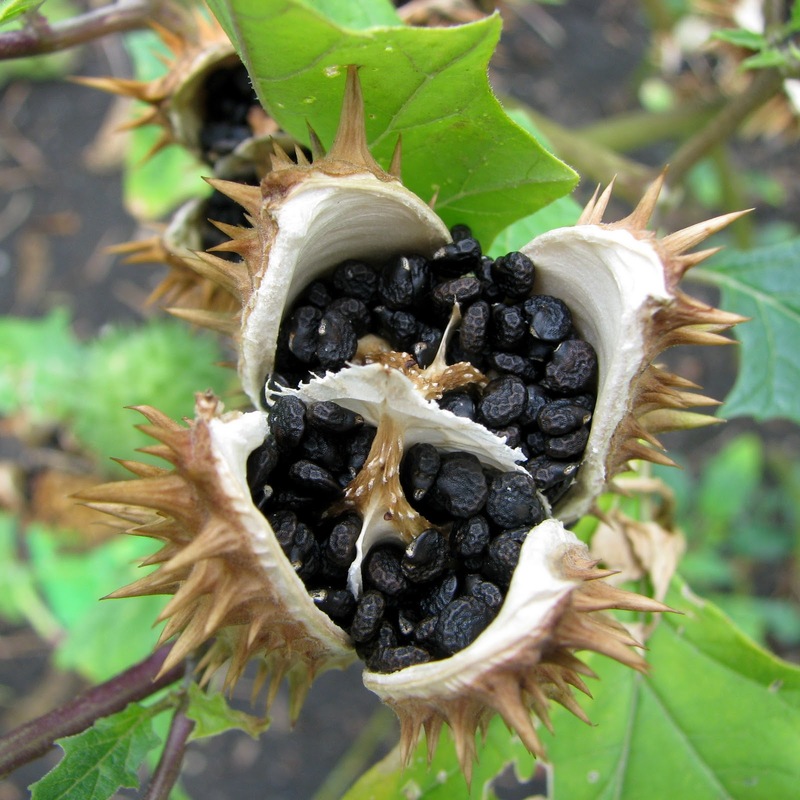 To help with germination, soak Angel's Trumpet seed in warm water for 24 hours before sowing. Place seed on the surface of lightly firmed, moist seed compost in pots or trays and cover with a fine sprinkling of compost or vermiculite. Gently water, then seal container inside a polythene bag and keep at a temperature of between 15-20ºC. After sowing, do not exclude light as this helps germination. Try to keep the surface of the compost moist but not waterlogged. The seed should germinate within 14-30 days. When large enough to handle, transplant seedlings into 3in pots or trays. Plant out once plants are well grown approximately 5 ft apart or transplant into 10in containers. For best results, provide a moist, well-drained soil in full sun. Do not feed the plants at this point, but water well. Provide a minimum winter temperature of 7C (they may need to be brought in under protection to achieve this) and reduce watering over the winter. Angel's Trumpet plants require minimal pruning, and the removal of old flower heads - although plants can be cut back to base during spring to rejuvenate every few years.